As usual an excellent plot, but at times a bit too much technical info. I really enjoy the series. As usual a thriller. 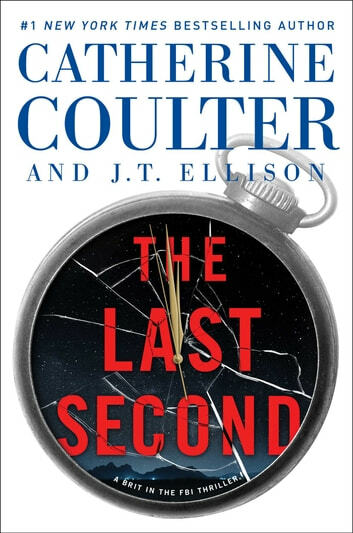 Ms. Coulter can grab your attention in the first chapter and keep turning the pages in marathon reading. Love the thrills. I am ambivalent about this book. Part of the problem with the book is the fact that I read it after I read a book that was very intense from the very beginning. Since this one wasn’t, it took me a while to get into it. I don’t believe that The Last Second is different in any significant way from the other Brit in the FBI books or Catherine’s other FBI books. Once the story changed from the back story of Dr. Patel to Mike and Nick it was much better. The part I liked was the way Mike and Nick work together. No matter what happened to them, they were there for each other. I gave it four stars. 4.5 Stars Review by Heather Late Night Reviewer Up All Night w/ Books Blog The Last Second by Catherine Coulter and J.T. Ellison is a science-fiction thriller. Nicholas Drummond and Michaela (Mike) Caine are back (introduced in The Sixth Day) and trying to save the world from a nuclear EMP. Dr. Neveah Patel is a brilliant woman and the biggest mistake NASA ever made was to ground her. She actually accomplished the goal of space travel, to communicate with an interstellar species, the Numen, and NASA doesn’t want to hear about it or for anyone else to either. Dr. Patel is then forced to show NASA and the world how wrong they have been and to make the Earth silent. Silent, so we can all hear the Numen for ourselves. Nike and Mike are in a breathless race against time to stop the deployment of the EMP and capture Dr. Patel before she wreaks such havoc on Earth that we might never recover from. The regular characters (Michaela and Nick and Grant and Kitsune Thornton) are likable and we are definitely rooting for them to succeed, but Dr. Neveah Patel is probably my favorite character. Is she mentally ill? And, if so, was she before she went to space or did something happen on her space walk? If she’s not mentally ill, is she evil? Part of me, really wanted her to be right, but as the book progresses she becomes harder and harder to identify with. As with some science-fiction, a certain suspension of disbelief is required to enjoy this book. The idea that someone could launch such a catastrophic device (nuclear EMP) into space even via a private space company is ridiculous, but once you get past that the story is fast-paced and engaging. I highly recommend The Last Second, it will definitely keep the pages turning until the end.